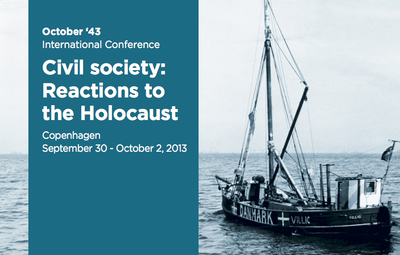 In commemoration of the 70th anniversary of the rescue of Danish Jews, this unique international conference focused on themes of civil courage and civil society at the time of Holocaust. The conference, "Civil Society: Reactions to the Holocaust" featured contributions from outstanding speakers including, Richard Breitman (USA), Ulrich Herbert (Germany), Irene Levine (Norway), Ronald Leopold (Netherlands), Konstanty Gebert (Poland), Sofie Lene Bak, Bo Lidegaard, Herbert Pundik (Denmark), Annette Wieviorka (France), Karin Kvist Geverts (Sweden), Oula Silvennoinen (Finland), Anthony Giorgieff (Bulgaria) and Manfred Nowak (Austria). This conference was generously supported by Oak Foundation, Oticon Fonden, Jyllands-Postens Fond, Sportsgoodsfonden Frimodt-Heineken Fonden, Politikens Fond, Tømmerhandler Johannes Fogs Fond, Knud Højgaards Fond, Letterstedtska Föreningen, IK Consultancy and the German Federal Foreign Office.